Brad Pitt starrer ‘Moneyball’, released in 2011, made the concept of using data science in sports globally understood. For sports nerds though, the book that inspired the movie – ‘Moneyball: The Art of Winning an Unfair Game’ by Michael Lewis, is the definitive work that made people aware of how data and AI can transform the fortunes of a sports team. While “Moneyball” and the story of the Oakland A’s in baseball’s Major League did indeed represent one of the best known early uses of analytics by a sports team, it is a fact that with advances in machine learning and AI, the impact of data science in sports has increased manifold. In fact, it will be fair to say that today, athletes and teams in most well developed sports need to be using the latest technology just to keep pace with the rest of the pack. I have been involved with the business of sports in different capacities for the last fifteen years. So, on completing my certification in data science and machine learning, it was natural that I grew more interested than ever in the applications that AI has found in the world of sports. Today, I am sharing with you some great examples I have found of AI and machine learning transforming the world of sports in recent times. This is just a small list of ways in which the industry is benefitting from AI. However, there are two things that clearly stand out here. First is the scale of the leap that technology has made is illustrated by current solutions. From discovering important statistics that were ignored during the ‘Moneyball’ days to being able to calculate the probability of an event happening (goal or not) in real time, the ability of data to impact performance has increased exponentially. Second, AI and machine learning are finding applications that have major business impact, much beyond improving performance on the field. AI is helping businesses serve fans faster, better and make more money in the process. When the industry was still in infancy, analysts across sports understood the criticality of capturing data for every play that occured. Most of the sports data industry developed by building analysis tools over video and associated metadata for every play. These solutions almost always involved large sets of people manually processing every second of video footage and adding the required metadata. Over the years, the big problems around scouting and coaching that data science is looking to solve remain the same. What has changed is the volume and nature of data available to them, as well as the tools available for processing them. Wearable technology has embedded accelerometers and gyroscopes that are providing movement and health data like never before. On the other hand, advances in computer vision have made it possible for computers to get more information from every second of a video feed, than a human being would. In this TED talk from 2015, Rajiv Maheswaran, CEO and Co-Founder of Second Spectrum demonstrates the technology his team built using AI to transform the way player movement in basketball could be tracked and analysed. A must watch not just to see the amazing technology at work but also for a great example of how storytelling about technology can be effective. And the answer to the big question – can the machine be smarter than the coach? Television and online broadcast form the most critical component of sports revenue and also the primary mode of consumption of sports entertainment. It is also an area that has seen massive transformation in the last decade. From the days of television holding monopoly over access to major events, we have very quickly reached a stage where internet connected devices have become the norm for how a sporting event is followed. For the media and broadcasting industry, this has required major changes in the manner they create and disseminate content. If they are not the first to share the video of a goal or a wicket on social media, somebody else will. If they can’t provide the best stats, best archival material when it is relevant and behind the scenes footage that fans crave for, then all of these can be provided by someone else. In short, if the media houses cannot be the dominant creators of content that fans want, they risk losing their position of dominance within the industry. AI is proving useful to the sports broadcasting industry in many different ways, but perhaps one of the most important ways is by helping them become more efficient and more productive. The best solutions for broadcasters then are not just the ones that use technology to do amazing things, but also those that integrate seamlessly with their operational requirements. Tedial is a company headquartered in Malaga, Spain and they have used their experience of working with broadcasters to develop a solution that uses AI to help them index their entire content in a flash while also providing tools for editors and producers to quickly create content offering for fans. The video is a presentation of the challenges that broadcasters face and how their solution built on AI, is helping them overcome those challenges. AI is also attempting to give more power in the hands of fans when it comes to deciding how they wish to follow a particular game or sport. Steve Ballmer, the former CEO of Microsoft and the owner of LA Clippers, a basketball team that plays in the NBA, is also a passionate sports fan himself. When Rajiv Maheswaran of Second Spectrum showed him the product he had created to track and analyse player movement on a basketball court, Ballmer was excited not just by how useful the tool was for coaches and scouts, but how awesome it could be for fans to have as well. In a segment (from 18 min 45 sec to 26 min 50 sec) of this engaging conversation below, Ballmer explains how fans could experience sports completely differently from how they have known it and shows specific things that he believes will transform fan experience. With digital experiences getting better each day, do fans have any incentive of actually going to a stadium and watching the game? For the sake of athletes, teams, federations and broadcasters, it is absolutely necessary that they do. Cheering fans inside a stadium can lift or worsen a player’s performance, an umpire of a referee’s decision making ability and also reduce the excitement levels for people watching the action online or on television. It is no surprise then that a lot of AI companies interested in sports are focusing on improving in-stadia experience for fans or helping teams attract an increasing number of them to live games. 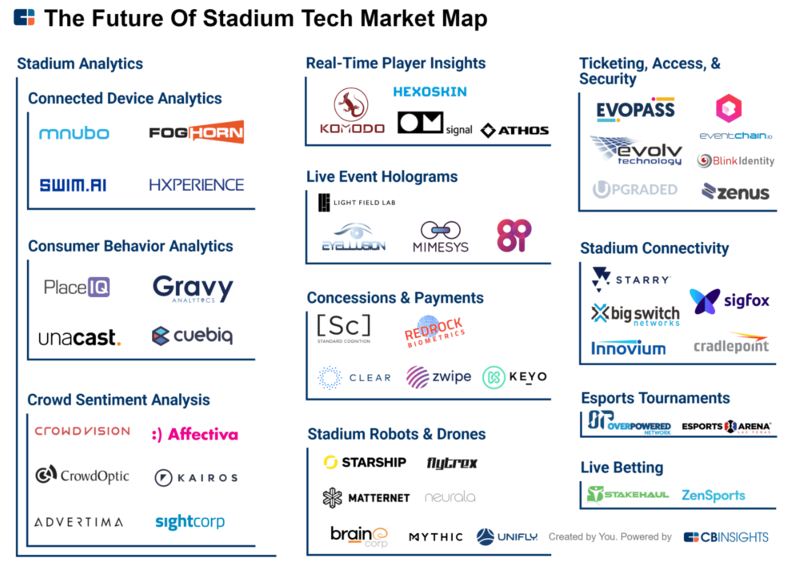 An excellent recent article on startups tackling sports stadium technology, presented this explanatory infographic that helps form an idea about the different kinds of initiatives afoot in this space. AI is driving new approaches in almost all of these specialisation areas and many of these startups have created mind blowing solutions. One of the most interesting solutions I find in this space is the one created by Blink Identity, which uses facial recognition technology to identify people moving at full speed. In other words, people do not need to stand in front of a camera or lens and have their faces scanned. The implications for different stakeholders are very interesting indeed! For event organizers, the technology can help in managing access of people within the arena – for example, to regulate access to VIP zones. For security personnel, it can be a tool to quickly get alerted if a known trouble maker or security threat is spotted in the crowd. Fans who have linked a payment device to the venue’s platform can buy merchandise or refreshments inside the venue by just picking up what they want at a store, while the amount gets automatically charged to their accounts. Businesses with contracts to sell things at the venue, too profit because of this. No surprise then that Blink Identity has attracted a lot of attention within the industry, including investment and partnership with TicketMaster, a major event ticketing solutions provider. Machine learning and AI are enabling rights holders and media companies to offer innovative solutions and value to customers ways that were not conceivable just a few years ago. The same solutions that allow media companies to create more content at a faster pace, also end up allowing sales people to offer branded content packages customised to the need of specific brands. For example, a highlights segment sponsored by a toothpaste brand could include instances of players grinning at each other (“Colgate Moment???”)! Fans watching the same live stream or archived video can be served ads based on their personal preference and behaviour, thanks to advanced machine learning algorithms making ad servers smarter than they have ever been. Another interesting AI driven application is helping brands measure the exposure they get in return for their sports sponsorship investment, more effectively than ever before. Image recognition technology can capture how often a brand was seen on television screens, how long they were on display for, as well as the quality of exposure. For example a brand may derive a lot more value if it was captured during a piece of action that people are likely to watch over and over again. Mumbai based startup AthenasOwl is doing some interesting work in this space. Using image recognition capabilities, they offer a bouquet of solutions to sports broadcasters, including the ability to provide great measurement metrics to advertisers. An interactive tool to see how they tracked brand exposure during the FIFA World Cup 2018 can be viewed here. Happier and more engaged fans lead to higher revenues for companies in the business of sports. Some of the ways in which fans are kept happy are by great performances by their favorite athlete or team on the field and access to videos and other content from a game in the format and time that is convenient for them. We have seen examples of how AI is helping businesses deliver better performances as well as better content to sports fans. There are of course many other aspects that go into keeping a fan happy, many of them being applicable to other industries as well. For example, a smooth ticket purchase experience, ease of parking and the quality of food served when going to a game, availability and affordability of quality merchandise, access to star athletes, having a voice in how the team or institution is being run, and a lot more contribute to making and keeping passionate fans happy. AI is being used by solution providers addressing each of these areas – from managing congestion at the venue on matchday to creating personalised merchandise based not just on current trends but individual emotions and preferences. Among the various kind of products that have come up to help sports businesses serve their customers better, chat bots have created quite a stir and are serving the industry in many different ways. Chatbots are helping sports event organizers communicate personally with people who are headed to the venue. In events with mass participation like a marathon, they can also play a critical role in managing event logistics. Bots are being used to update fans with the latest information and content from the field, to promote tickets and merchandise for sale and also to offer 24/7 customers who face issues in purchasing any of these products. The Wimbledon Messenger is a great example of how the biggest sports properties have embraced the opportunity provided by chatbots to serve fans better. The messenger has been created to have conversations with fans at the venue or in any corner of the world. The Wimbledon Messenger offers expected services like providing updates and feeds on popular players. It also takes care of things that are less predictable. For example, it was observed that fans asked the bot questions like the stall where they could get the cheapest strawberries at Wimbledon! Sports is far from being the only industry that is being transformed by AI but it sure is one of the most interesting areas of application for technology, given the passion and fervor that sports generates. With innovation happening at a rapid rate, it is a challenge just to keep track of all the latest cool products that are looking to solve problems in this space. However, it is also true that many solutions that are being created using the latest tech are struggling to succeed in the market. The fundamentals for success remain the same as ever – smart technology also needs to be useful and that happens when the team building the technology has a solid understanding of business requirements. Madhukar Jha believes that great digital experiences are created by concocting a perfect mix of data driven insights, understanding of behavioural drivers, a design thinking approach, and cutting edge technology. He applies this philosophy to help businesses make world class products, run campaigns that rock and tell compelling stories.